Cameron Weller is a professional artist specialising in a traditional style of landscape and marine painting. 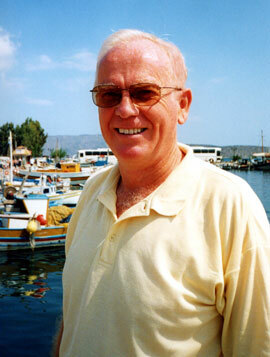 He paints mainly using watercolours and oils, but also uses acrylics, gouache and other media. He particularly likes painting classic boats – Thames Barges, Essex Smacks, Brixham Trawlers etc., shown in all weather conditions and many of these paintings are to be found in collections all over the world. His experience of sailing a wide range of craft has helped him capture the atmosphere required for demanding marine commissions. His landscape paintings of a wide range of subjects, including Sussex scenes and his limited edition prints have also proved very popular. 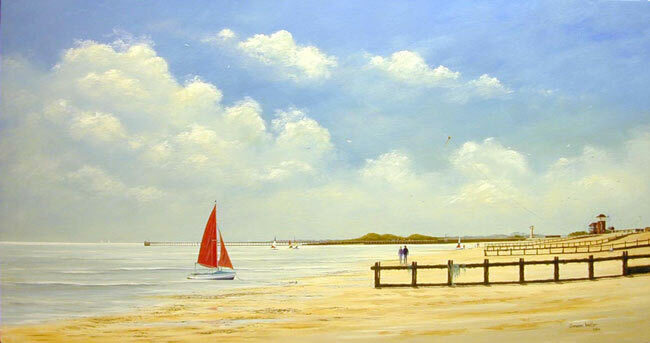 He has exhibited widely although he now concentrates mainly on commissions and was Chairman of Arundel Art Society for seven years. Cameron is a qualified Adult Education tutor with many years experience of teaching water colour painting, mixed media and drawing, and runs a range of private classes in Worthing and Rustington. He also teaches painting and drawing at Worthing Leisure Centre, weekend courses at The Earnley Concourse, near Chichester and was a tutor at Northbrook College (Sussex) for eleven years. Cameron also teaches painting, drawing and computer image editing to a small number of private students on a one to one basis and runs an art materials supply business. He is a great believer in the importance of drawing as a basis for landscape and seascape painting and encourages all his students to use their sketchbooks. Cameron was educated at Wrekin College, Shropshire and gained a post-graduate Diploma in Management Studies at Brighton Polytechnic. He became a professional artist in 1991 after a career in the packaging industry – including 6 years as a Financial Director and 10 years as a Managing Director. This demonstration shows the development of a very large painting (1.5m x .75m) using acrylics on canvas. 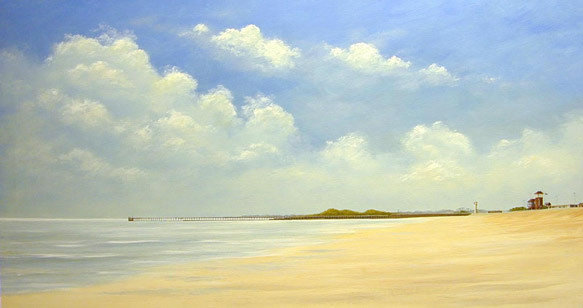 The commission required an afternoon scene of Littlehampton Beach, looking West along the beach towards the harbour entrance. The substantial canvas was made for me by Angmering Framing and the first job was to prime it with four coats of gesso primer. The general composition was discussed with the client, who fortunately gave me plenty of scope for the final detail. The original idea of a sunset was dropped because the resulting silhouettes in the foreground would lack colour and because the sun sets well inland – not conveniently over the sea! 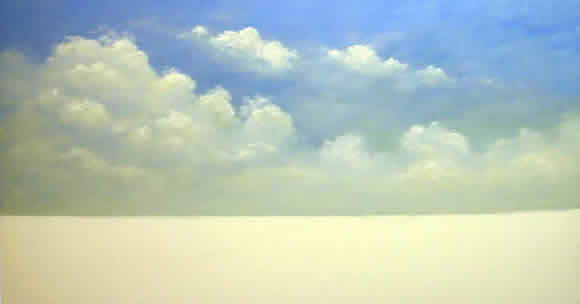 The horizon line was established and a bold sky painted. Next the distant blue/grey trees etc., are put in followed by the sand dunes of West Beach and the initial painting of the sea. A band of light is suggested on the sea, where it meets the sky. The Coastguard building and Lighthouse are added together with the breakwater. The sea is made more interesting with the addition of some small waves and the underpainting for the beach is put in. 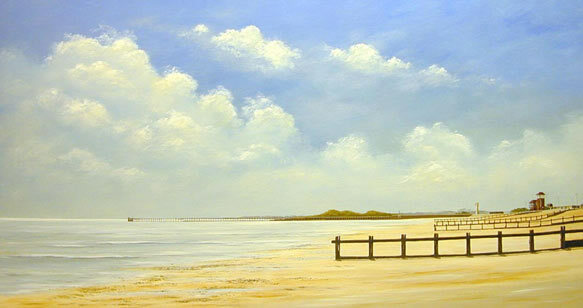 Now the groynes can be added and some more work carried out on the foreground. Note the perspective – the viewing point is slightly higher than a standing adult – to allow more of the sea and beach to be visible and to avoid all the groynes overlapping. In goes the boat, which immediately becomes the focal point and brings the painting alive. 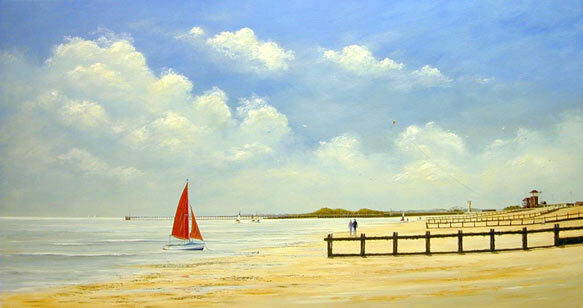 The two figures (my clients) are added walking along the beach; a little further away to balance the composition. A kite is also added above the distant dinghy on the beach. acrylic on canvas 1.5m x .75m, commissioned by Mr W. Donaldson. This was a very enjoyable painting to work on even though the blank canvas was a little intimidating initially! I hope you enjoyed this tutorial and learning more about Cameron’s painting techniques.